No more paper, messy spreadsheets, or manual calculations. Know exactly when employees arrive and leave work. No more guessing. Spend less time doing payroll. Automate the stuff you hate! 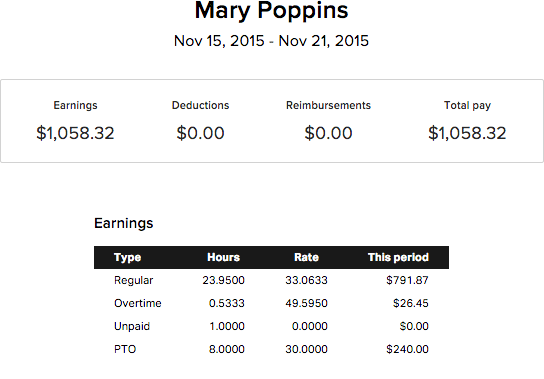 Run payroll reports in just a few clicks. Eliminate buddy clocking by tracking their GPS, voice, or device. See who's working when and where, all in real time on the web. Yes, with real humans. Our support staff are always ready to help when you need them. We live and breath design. Even our grandmother thinks it's easy to use. 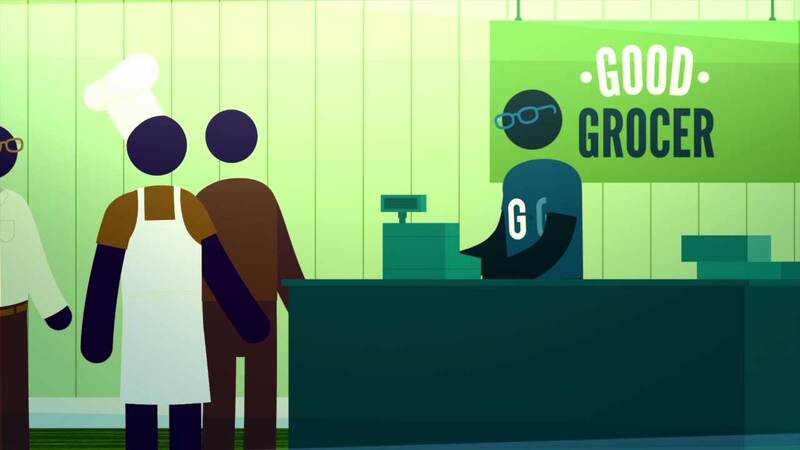 Perfect for small businesses, franchises, and mobile teams. We've helped thousands of companies big and small end manual time tracking for good. Clockspot has reduced the time it takes us to do payroll by 75%, saving us 5 hours every 2 weeks. I recommend Clockspot to any company big or small that has employees working remotely. As a small business owner I have to wear many hats. Clockspot looks after keeping track of my employees hours so I don't have to! I have saved literally hundreds of hours in time that I can devote to growing my business instead of handling time sheets. Best investment I ever made! Simply put, Clockspot is amazing! It not only helps us keep track of time, but also allows us to communicate with our employees more effectively. Clockspot has made keeping track of employees the easiest thing in this business. Clockspot has made keeping track of employees the easiest thing in this business. And in our business, nothing is easy. Thanks Clockspot! 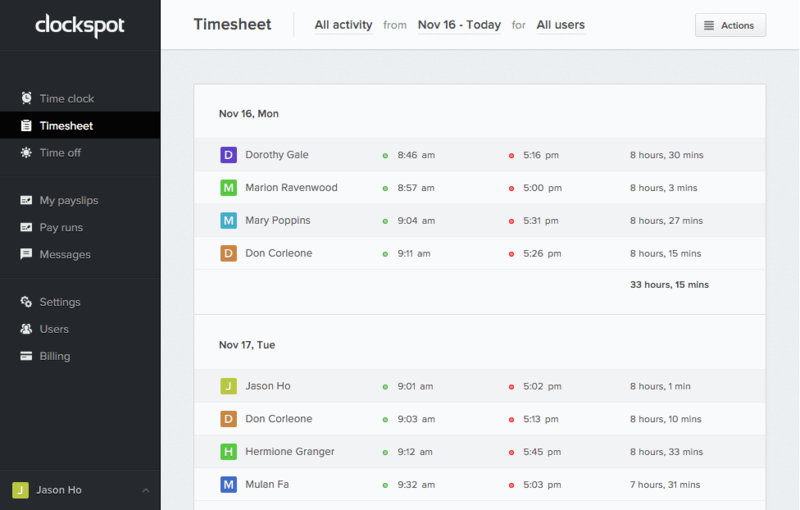 I have tried several online timesheet systems, and Clockspot is by far the easiest to use. I love that I can quickly tell which of my employees are clocked in, and what they've been working on. I'm very particular about quality user interface and I find Clockspot to be well crafted. As a result, I find that it requires little to no staff training. I'm also pleased that periodic function and design upgrades have been applied since my initial purchase. With Clockspot, everything is stored in the cloud and backed up daily. Clock in from any phone, landline or computer in 30 seconds or less. See when and how employees clocked in – including GPS and caller ID. Review, edit and approve timesheets online from one simple hub. Add job codes, set up pay runs and calculate accruals automatically. 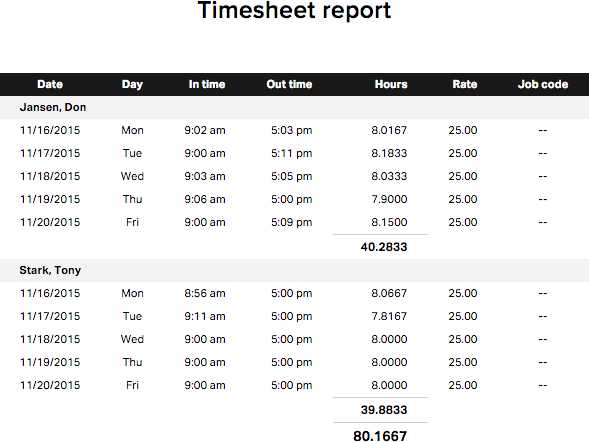 Timesheet, overtime, and payroll reports. Get detailed reports in just a few clicks. Print or export your data anytime. 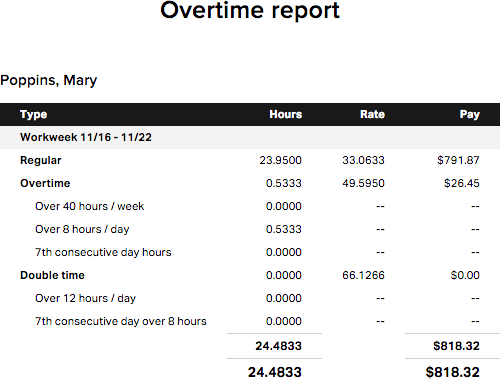 Monitor overtime breakdowns, get alerts and optimize your scheduling. Create detailed payroll reports a testing details in a couple of clicks. Why choose us? Because we care more. Time tracking is all we do. We're constantly thinking about it so that you never have to again. With plans that start at $5 per user / mo, you save money on every payroll. Clockspot is time tracking that pays for itself. You’re one click away from making timesheets totally painless. Try Clockspot free for 15 days. Setup takes just a few minutes.